You will be notified of the request by email, SMS and/or push through the app depending on what you have enabled. To respond to the request click the relevant cell on the rota and a pop-up will again appear. It will display the message sent by the employee, as well as a box to reply and buttons to approve or deny the request. On approval the shift will automatically be moved to the open shift section of the relevant day and become unpublished. A green unavailability dot will display on the shift as a reminder of the approved unavailability request. You can now reassign the shift to a specific employee if they wish or leave it in the open shift section allowing an employee to voluntarily assign it to themselves on a first come first served basis. If the request is denied the employee will be notified by email, and a red unavailability icon will be attached to the shift. 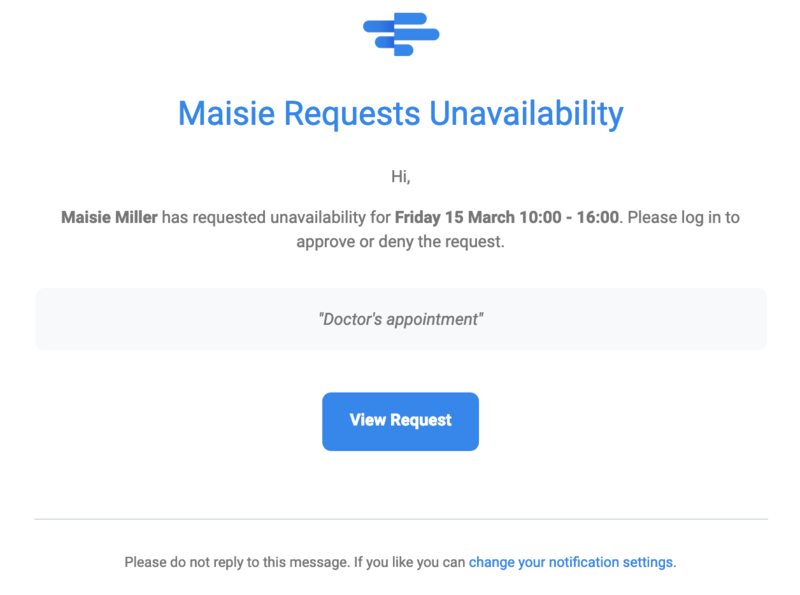 Further unavailability requests made for shifts which have already had requests denied will now be met with a warning to remind the employee before they try the request again.